In this session we are going to learn about Backup Compression in SQL Server, which is introduced in SQL Server 2008. 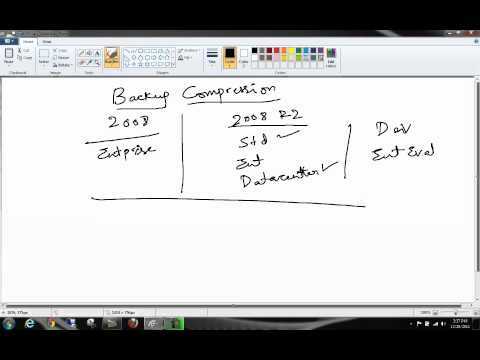 SQL Server 2008 introduced a feature called Backup compression where you can compress your backups while performing a backup without any 3rd party tools. And in SQL Server 2008, this feature was available only in Enterprise Edition, and was not supported in any other versions, so you cannot compress a backup using any of the other Editions in SQL Server 2008. Starting from SQL Server 2008 R2, this feature is available in Standard Edition, Enterprise Edition, Datacenter Edition. (apart from Developer and Enterprise Evaluation Editions which has same features as Enterprise Edition). So this feature is expanded to 2 other versions in SQL Server 2008 R2. What happens with backup compression? Watch the video for more details…. This entry was posted in Uncategorized and tagged Backup Compression by Brumedishetty. Bookmark the permalink.